Cartier Delices is a sparkling, ultra-feminine fragrance that is an irresistible temptation. Cartier Delices is encased in a beautiful jewel bottle in the shape of a juicy fruit and is a fruity-floral scent, created as a shining, spellbinding and playful perfume surrounded with glowing sensations. Cartier Delices is a vibrantly sensual and feminine scent dusted with a touch of fantasy and mouthwatering sweetness. Cartier Delices EDP begins with a fresh floral accord of bergamot, pink berry and morello cherry for a spicy burst of sweet fruity freshness. This is crafted over a sot powdery floral essence of jasmine, violet and iris accord and a rich oriental trail of patchouli, vanilla, tonka bean and benzoin. Cartier Delices EDT is a delicate, fragrant jewel for the skin. 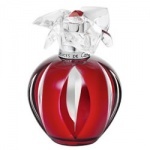 Cartier Delices EDT is an irresistible caprice of fruity and flowery sensations encased in a jewel bottle that is exceptionally feminine and glamourously red.